Tonight the Chicago Bulls (21-57) visit our nation's capital for the second and final time this season to take on the Washington Wizards (32-46) at Capital One Arena. Chicago won the first matchup in DC on December 28th, 101-92, but the Wizards bounced back the next time in Chicago, 134-125, on February 9th. That contest took place three days after the teams completed a major trade in which Chicago acquired veteran small forward Otto Porter Jr. from the Wiz, while DC picked up Bobby Portis and Windy City native Jabbari Parker from the Bulls. Washington's Bradley Beal led all scorers that night with 31 points, while Parker and Portis came off the bench to post 20 and 10 points, respectively. Portis also grabbed a game-high 12 rebounds. Zach LaVine led the Bulls with 26 points, while Lauri Markkanen chipped in another 20 and grabbed 11 rebounds. The third time the Bulls and Wizards met took place on March 20th, also at the United Center, with Chicago coming away with a 126-120 OT victory. Once again Markkanen was on the mark with a team-high 32 points and 13 rebounds. Kris Dunn also had a strong game, notching a season-best 26 points and 13 rebounds of his own. Shaq Harrison stepped into the Bulls starting lineup for an ailing Zach LaVine, and contributed 18 points and four steals. Parker stormed off the Wizards' bench once again to lead DC's charge with a team-high 28 points. The Wizards come into tonight feeling pretty good after rallying from an early 15-point deficit on the road to upset the playoff bound Denver Nuggets, 95-90, this past Sunday. Rookie first-round pick Troy Brown Jr. posted a career-high 24 points and grabbed seven rebounds, while once again Jabari Parker provided punch off the pine with 20 points and six boards. Washington's main man in the middle, 6'11 center Thomas Bryant, the 42nd overall pick in the 2017 Draft, also played a major role contributing 20 points, 14 rebounds and three blocks in 40 minutes of action. It was Bryant's third straight double-double, and over his last six he's putting up an average of 15.9 points, 11.7 rebounds and 1.2 blocks per game. The Bulls have been a major slump of late as they've dropped 12 of their last 15 games, including five in a row after falling to the Knicks in New York on Monday, 113-105. Veteran center Robin Lopez led the way with a team-high 29 points, while recent addition JaKarr Sampson added 22 off the bench while gritty guard Ryan Arcidiacono chipped in 14. 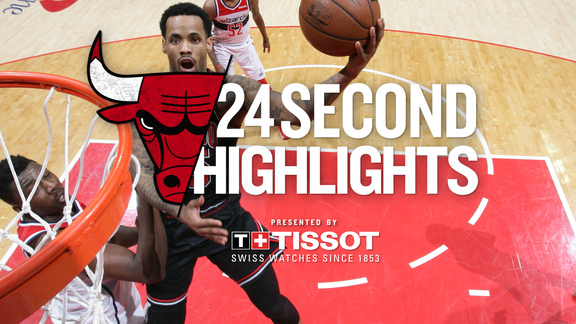 As a team, the Bulls shot just 44 percent from the field, and an even uglier 4-of-17 (23.5%) from behind the arc. Chicago literally limps into tonight with a long list of injuries to key players, many of whom have already been shut down for the rest of the season. That list includes Lauri Markkanen, 2018 first-round picks Wendell Carter Jr. and Chandler Hutchison, along with Denzel Valentine. Leading scoring Zach LaVine hasn't officially been shelved—yet—but he's missed Chicago's last six games while Otto Porter Jr. has been sidelined for seven straight and starting point guard Kris Dunn the last four. Combined, LaVine, Markkanen, Porter Jr. and Dunn average more than 70 points a game. None are expected to play tonight in DC. In order for Chicago get on a winning track this evening they'll need to show up with energy, fire and focus. They'll have to skip the ball selflessly from player-to-player and from side-to-side and get everyone involved in the flow. They'll need to force Washington's defense back on its heels by playing fast and persistently look to attack the basket at every opportunity. 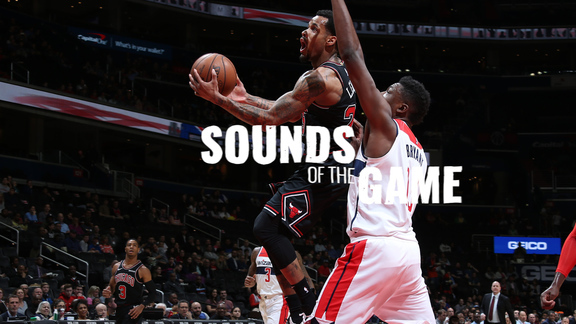 Collectively, the Bulls must sport a gritty attitude and play physical, especially when it comes to battling for control the paint and rebounding the ball off the backboard. Both offensively and defensively Chicago's undermanned crew will need to step up and take charge by establishing the willfulness to dictate a fast pace to the game. They have to take advantage of their athleticism by getting out on the break early and often to score easy, uncontested baskets before Washington's defense has time to set itself up and shut down driving lanes to the hoop.